Great news NAS lovers, a new high-value 7-bay NAS is now available on the market! 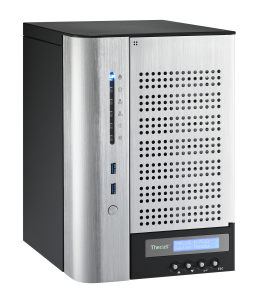 Thecus® put their hands together and added a new tower to theVision series. Equipped with an Intel® Atom™ processor, 2GB of DDR3 RAM, HDMI output and offering incomparable data protection with the McAfee antivirus, this NAS will offer lots of power and lots of storage capacity without spending lots of money. With the 2-bay N2800, 4-bay N4800 and N4510U and the 5-bay N5550, the 7-bay N7510 completes the Vision series of Intel® Atom™ NAS from Thecus®. As it is already been prove with the N5550 and N4800, the Intel® Atom™ CPU performs like a real Olympian athlete! As they are more energy efficient and are design to work without a fan, their energy consumption and associated cost are greatly reduced for the benefits of the user. This will dramatically reduce NAS noise and power consumption, making it a bit more ecofriendly. With the Intel® Atom™ processor, multi-tasking is something you won’t have to worry about. Multi-users environment(+64), web hosting, intense backup, data encryption, application serving, heavy RAID computations (mode 0, 1, 5, 6, 10, 50, JBOD and up to3 multiple RAID mode supported), and HD multimedia streaming, this processor can take it! As of early 2012, Thecus® embeds their NAS with the added protection offered by the antivirus McAfee. As your NAS can serve many clients, threat can come for anywhere. Scheduling McAfee to scan your vital data will give you the peace of mind you deserve! The powerful antivirus McAfee will browse through all your files, big or small, in a flash and assure that everything is secured! The N7510 will have the newly ThecusOS™ 5.0 preinstalled. The new ThecusOS™ 5.0 is the key piece that will unlock the most efficient and advanced NAS on the market. This means that users will be able to access more innovative functions with their Thecus® NAS. Two of these functions are Data Burn and Data Guard. With Data Burn, the users have the possibility to back-up their critical data by burning them onto a CD, DVD or Blu-ray disk. By plugging a disk burner to their NAS thru the available USB ports and managing the burning process. But your back-up options don’t stop there. Also included in the new ThecusOS™ 5.0 is the total backup solution, Data Guard. This backup solution is the ultimate software as it provides both local and remote backup. Currently, data is backed up across RAID volumes, external USB drives, and eSATA. In addition, Data Guard uses innovative technology to sync data across the network to other NAS and servers. More importantly, Thecus® Data Guard is the total backup solution which makes managing NAS user-friendly and convenient. Handling multimedia and accessing your NAS has become a much more direct and simple process! With the HDMI output located in the back of the N7510, you can directly connect to an HD TV screen and start monitoring your NAS without the use of a computer. Using the local display module, a keyboard and a mouse plugged through the many USB ports, the user has the power to simply access the NAS UI, play HD video, display pictures or listen to their music, all of this with the display comfort of a big TV screen. Ideal for small installations and/or mobile users, these features are designed to lower the total cost of ownership of your network architecture.